— from the Half Moon Bay workshop. [from Marsha…..What is trust? The dictionary says: firm belief in the reliability, truth, ability, or strength of someone or something. You don’t forgive ‘em. You don’t need to. The whole basis is to see that he felt he was right, proper, and/or justified no matter what he did to you. Now, the next thing out is – you say you trusted him. Now, trust means that you have already come to the conclusion that they’re going to do what they ought to do. You said you knew what ought to be in the first place, and that they’re gonna do that. You are predicting that you know the future, is that right? ……otherwise you wouldn’t trust anybody, right? Nor distrust. You wouldn’t have either one. You see, the biggest part of the “hurt” is because you “trusted”. And then what was “trust to you was betrayed” – that’s the big “hurt”, isn’t it? You know, you can get over having your face slapped or somethin’ like that; but being betrayed with the trust… Now, what grounds do we have for trustin’ anybody? What grounds do you have? No, you just don’t have any except that you assume you know the future and they’re gonna do so and so and so and so. And when they don’t, you crash; and you saw your trust was an illusion, is that right? And that’s what upset you – that you’ve been chasin’ an illusion. And they told me that the struggle towards an illusion is the only disintegrating factor in man. That’s right. You’re strugglin’ towards an illusion. You assume, number one, that you knew the future, hmm? And this person, therefore, was gonna do thus and so because you assumed. And sometime or other you found that they didn’t do that; and you, therefore, demonstrated that you did not know the future, right? And you were, therefore, strugglin’ after an illusion. When you saw the illusion, you crumbled up over it and you got what you called “hurt.” Hmm? I don’t know any reason to trust anybody ‘cause I don’t know the future and that’s the only thing you can go on. Now, I will make certain assumptions. I’ll assume that the person I sell something to; and they say they’ll pay in 30 days, that they will. But that’s only an assumption on my part, isn’t it? So we do have to use those assumptions; but I wouldn’t call that trust. Would you call it trust, John? That’s a start anyway, but there ain’t no reason to trust it, is it? None whatsoever. Okay? Does that help you out a little bit? That what? You have no reason to trust; and if you do, you’re struggling after an illusion; and what hurts is seeing that you had an illusion instead of a fact. That’s where the “hurt” comes from, believe it or not. BUT…those other people cannot justify it and do wrong anyway. 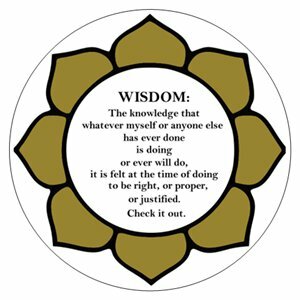 The teaching idea says: Wisdom is the knowledge that whatever myself or anyone else has ever done, is doing, or ever will do, it is felt at the time of doing to be right, or proper, or justified.